Video shows infiltrator beating a man in plain daylight, as Left continues to prevent deportations. 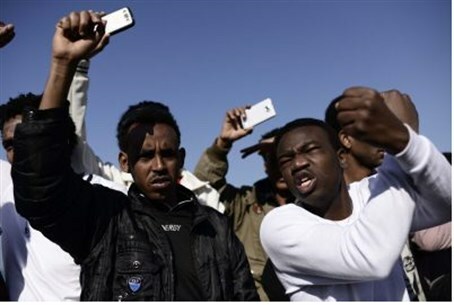 A video uploaded to Youtube and Facebook Monday shows an African infiltrator – one of the tens of thousands who currently reside in southern Tel Aviv – beating a man in plain daylight. It is not clear what the man is saying but he is obviously terrorized, and possibly suffering from mental problems. The infiltrator barks at him, in Hebrew, to sit, then proceeds to beat him with a plank. Residents of southern Tel Aviv have complained for years that the infiltrator population has made their streets unsafe – especially for women – yet leftist groups, supposedly concerned about human rights and women's rights, have been ferociously defending the “rights” of the infiltrators instead of those of the residents. The High Court, too, has repeatedly knocked down legislation meant to enable the detention and expulsion of the infiltrators, whom the Left has organized and emboldened. Activists have even issued a video pressuring African countries not to help Israel solve its infiltrator problem. The video followed reports that Israel is negotiating deals with with Rwanda and Uganda, in which the countries will absorb Africans who infiltrated into Israel, in return for lucrative trade deals. A report issued in late March by the British Home Office determines that defectors from the Eritrean army do not, in fact, face life-threatening danger in Eritrea, and therefore do not deserve refugee status in other countries. Britain has issued new guidelines for dealing with the Eritreans who have flooded that country.